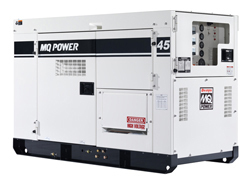 MQ Power’s DCA-45SSIU4C controls power within +/-1 percent of mean voltage. The unit generates 47kVA/37kW standby output and 45kVA/36kW prime output. Standard features include a complete power panel, automatic safety shutdown system, brushless generator design, easy maintenance design with direct access to all filters, and an internal fuel tank.